follow. This could be the player, the current event, or any other event. Any characters following a leader will follow that leader until they are told to stop following. The following method call is defined in Game_Character. This can be called by any character object such as players or events. Then the event specified by the move route will follow that character. If the event_id is -1, then the character will follow the player. otherwise, it will follow the specified event on the current map. Again, remember from whose perspective the script is being called from. I love the possibilities presented in this script. When I tested it out, I tried to get around the problem that an event follower does not carry over to another map. I had limited success. Using a common event, I was able to have the game check it the ‘event follower’ was in the party and for it to trigger the new event on the new map to appear and follow the player. All of that worked beauitfully. Where I ran into problems is where the new event follower/party member traveled up and away from the player character for every step taken. Not sure what I did, how to fix this or if that was the inherit tracking problem of this script. Has any one else encountered this? Is there a way to fix it? I was trying to create an interactable group with this. Hey can you help me? In the game, when it is the “follow” queue, the alert “Reference Error follow is not defined”. Is it because I am using it on MV? If it is, is there a script for MV? Thank you so much! Is there any possible way we can have it so the events do follow the player to other maps? I really really need this to work this way and I’m counting on this script for a party system in my game where you can talk to party members interactively. This script does not provide support for moving events from map to map. If there was a script that provided such functionality I could write a plugin. The main issue with such events is that it becomes a bit more complicated for eventing since the ID’s are no long known beforehand. 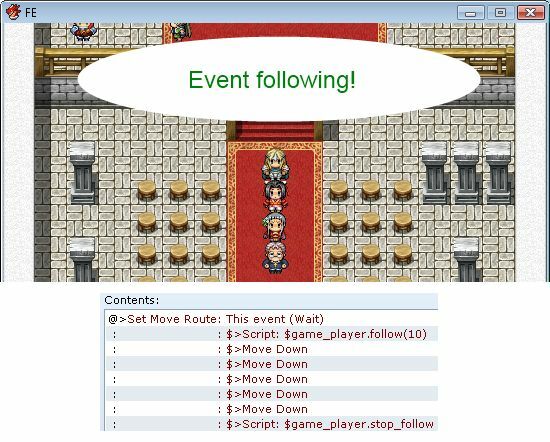 I’ve put the follow script command in the move route of the events I want to follow the player. I’ve copied the script in just as is, no modifications. It looks like you have a script that adds something called “Fake Followers” that seems to be causing compatibility issues. Script ” line 98: NoMethodError occurred. This script only supports the script calls in move routes. Script ‘Game_Interpreter’ line 14411: NoMethodError occurred. Can you show a screenshot of how are you calling follow? Yes, that’s a good screenshot as it shows what you’re doing that’s causing the problem. Thank you. I must have missed that somewhere . Hi again Tsukihime. Is there a way to have this code make the event follower follow diagonally like the normal followers? I copied the code that normal followers use. Do they not follow diagonally? What happens when you move diagonally? The real follower follows even when moving diagonal while the other one stops. Which diagonal movement script are you using? I’ve updated event followers to support diagonal movement. If you’re using my eight-dir movement script that has been updated as well so event followers move properly. Thanks! 😀 That test was done with a blank project, so I was not using any diagonal movement scripts. Now the diagonal works for events following the players, but not for the player following events. Otherwise, it seems to be working as intended! I may have spoken too soon, events following other events also do not follow diagonally, just like the player following events. Thank you sooo much! It’s working perfectly now! Wonderful, It works perfectly as far as I can tell now! Thank you! Whenever I load a save file that’s on a map with my event follower, the event flies away diagonally instead of following the player. Can you reproduce that in a new project and then send it to me? I have an event follower the player, and then I save the game. Then I load the game, and the event is still following the player. Script ‘Event Followers’ line 96: NoMethodError occurred. Did you start a new game or load a save file? I loaded a save file. All right, I started a new game, and it works beautifully now! Thanks! “Script ” line 2: SyntaxError occurred. The first line of the script should be =begin. If it’s not there you have missed a bunch of lines or you have deleted the header. Is there a way to disable the "Through" setting in this script without having to create an entirely new parallel process to get around it? I want to be able to have an NPC follow the PC around and also have them to be able to be "talked to" with the action button (similar to an RPG like Rune Factory). I have a problem with this script and I don&apos;t know why. If the player is in the map when the game starts, the event has no problem following it, however if I change map with an event and create a new event to follow the player on the new map, the follow behavior just continuous going up diagonally no matter the direction the player is moving. Does this occur in a new project with only event followers? 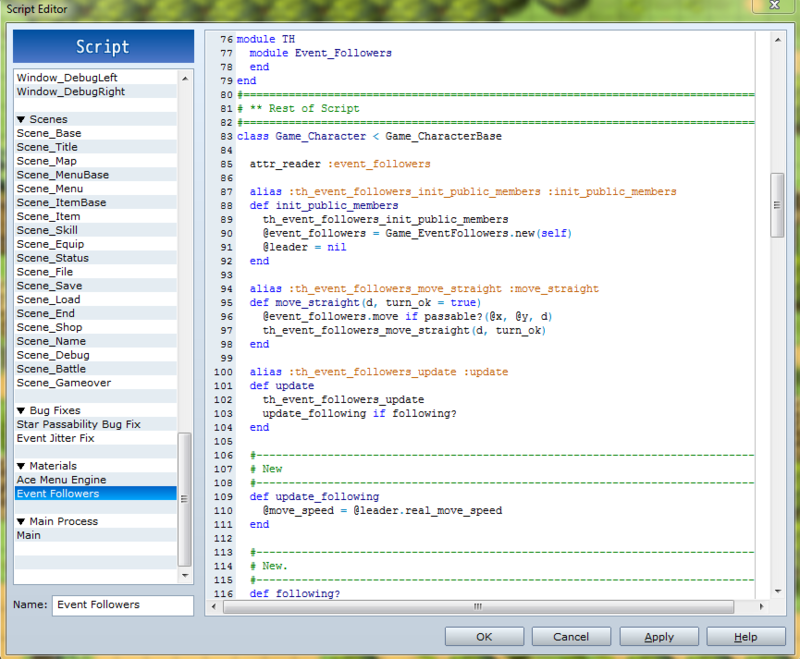 It works in a new project, however I comment all the other scripts and the problem is still there on my game. If I remove the event from the initial map the second one on the other map works perfectly… Maybe that can give you a clue on what the problem might be. Ummmmm…. I know this is late but I just started learning how to make games, I&apos;m still pretty new to this stuff, what does this mean? Script " line 84: NameError occurred. Are you installing it according to the instructions provided? That does look kind of funny. I&apos;ve edited the script as you have suggested. Thanks for catching that. This script is only for Ace. I have no idea what this means- My deadline is in a couple of days so I probably won’t have time to wait- I’ll just do something else here. Thought I’d let you know though.. 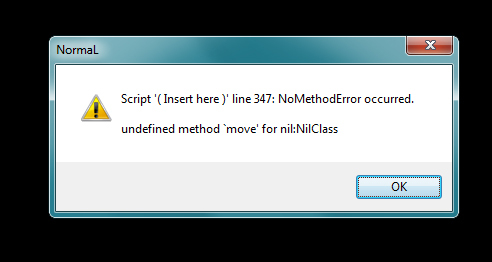 This script is only 310 lines long your error message refers to line 347. That script is causing the event following to crash? this program makes my brain hurt sometimes…. Wow, if I knew about this script earlier! XD Great job. Script updated to correct all follower behavior when following another character. Script has been updated to correctly match event follower speeds with the leader’s speed under any circumstances. The event doesn’t seem to match speeds with the player when it runs. Do I have to set something manually to make it work? 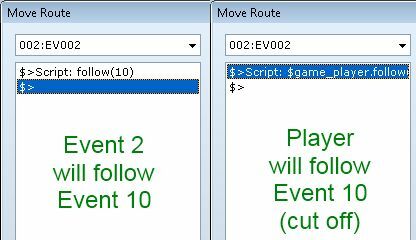 I set a custom move route to an event with only the script follow(-1) added, and the event just keeps walking even when I push A (shift) to run. The event followers aren’t really perfect sometimes and I’m not really sure why. I’ll look into it at some point. Will they follow the player to other maps too? No, since events cannot transfer.